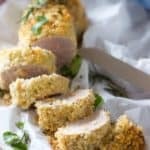 This Crispy Pork Tenderloin comes together in a flash! Rolled in panko crumbs, garlic and herbs it takes less than 10 minutes to prep and in the oven it goes! Preheat oven to 400 degrees. Line a baking sheet with foil or parchment for easy clean up. In small bowl. Combine panko, olive oil, garlic and rosemary. Brush dijon mustard onto pork loin. Pour crumb mixture onto parchment paper or foil and roll pork loin into it. Covering all the entire loin. Bake for 25-30 minutes (will vary based on size of pork loin). When meat thermometer reaches 165 degrees, remove from oven and let rest 5 minutes before slicing. Serve with honey mustard dipping sauce.